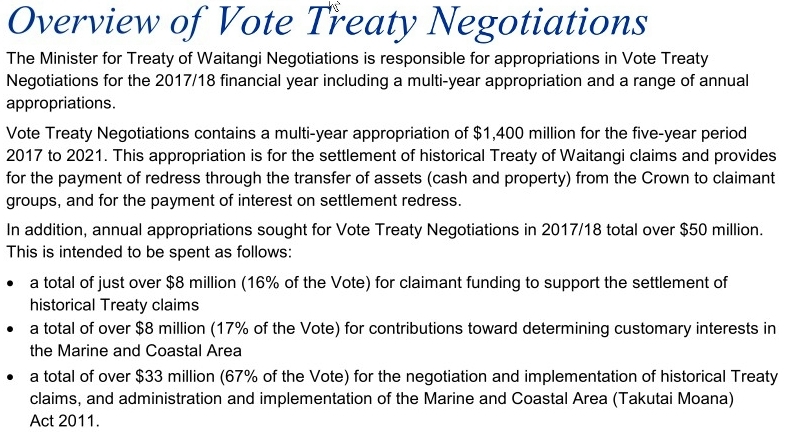 Vote Treaty Negotiations contains a multi-year appropriation of $1,400 million for the five-year period 2017 to 2021. Yes – you read that right. 1.4 billion dollars of taxpayers money and taxpayer-owned assets being given to part-Maori in unabashedly racist-vote-buying by National. It’s presumed that’s in addition to the “$93 million for maori development” mentioned, here. Remember that any non-part-Maori who wants to object to their customary swimming beach being fraudulently grabbed must pay a Court filing fee of $110 to lodge that objection. So – lucky you – you get to pay twice. Once to cover the beach stealers costs and another to pay your own. Vote National for more and more of the same. Labour or the watermelon party (Greens on the outside, reds on the inside) would be just as bad, if not worse. This just goes on getting worse and worse! So who should we vote for? NZ First? ACT? It’s getting worse all the time. Lets hope that the National voters will join the people and wipe the National party off the face of the earth. We cannot afford to let this National party destroy our country by giving these people total control over our marine and Coastal areas. New Zealand First is our only hope of reigning this in – hopefully they will win enough seats to be the power brokers. Weasel-faced Finlayson will soon do what he has done before….say ‘no’ to a part-Maori claim and this will be reported on the News. To the uninformed, they will see that Finlayson said ‘no’ to part-Maori and incorrectly think, he’s just the man we need to keep the part-Maori in check. Weasel-face has done this before and he will do it again. So true, sad and frustrating. It’s government racism and government separatism and government apartheid. It’s taking NZ back to the Third World, then eventually back to the Stone Age again. All forced on to NZers by troughing racist politicians. As a concerned citizen of NZ ? We all need to get NZ First into power and stop the Racist National Party before they destroy NZ. The behind scenes that are going on between the National and the Maori Parties is racism at its worst. Maori are not INDIGENOUS and most have been paid out 100 of years ago with muskets, Etc. Double dipping. Hopefully this is allowed, but another website exposing the daily part-Maori rorts is at Kiwi Frontline Forum. Well worth a look, to see how every day, we are discriminated against.